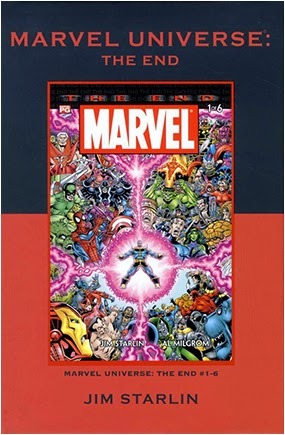 • DESCRIPTION: Volume 52 - "Marvel Universe: The End!" Collects Marvel Universe: The End (2003) #1-6. Story and art by JIM STARLIN. Jim Starlin is back, and this time he destroys everything! When the immortal Egyptian pharaoh Akhenaten gains cosmic powers, his first act is to annihilate the Avengers and the X-Men! The universe is endangered, and Thanos and Dr. Doom may be the world's best chance at survival! Featuring lead roles for Thor, Zeus, Captain Marvel, Dr. Strange, Namor and the Silver Surfer! And Thanos, more powerful than you've ever seen him! Hardcover, 168 pages, full color.